As per the last two outings to Garnett's and Jars Of Clay, we find Kev and Ed at the mercy of Andy's rigourously safe driving. Today, however, things are spookily quiet. Boyton Boy has somehow borrowed a car of the future, a Vauxhall Ampera. It doesn't hover -- shame -- but it is part electric. Let's hope that our battery lasts longer than Andy's iPhone. Third of an hour gone and we're cruising past the new Mayflower Green development on the blurred edge of Saxmundham. Eyes peeled for a caff near the station and it's nowhere to be seen. Market day too so can't park anywhere near pre-visited and perfectly pleasant Trinity's Cafe. Nabbing a spot outside Waitrose, we saunter down a side path (past a Pump Street Citroen) and emerge on the high street. 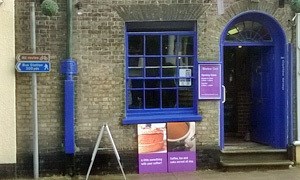 There, opposite the superbly symmetrical Bell Hotel, sits the dark blue frontage of The Bistro. More like a restaurant? Our guidelines being as loose as they are, that "coffee shop" lettering is sufficient to lure us in. Given the hordes, not too bad a wait before we're tucking in. It's good. In fact it's very good, and easily the best we've had on our travels since the Cult Cafe. Hugely disappointed, though, that there just isn't time for dessert. That pistachio slice had my name on it. Be brisk and beat a path to The Bistro. If it was a car -- Subaru Vivio Bistro. If they were passing by -- Quentin Willson.